At different times of the year- and at different stages in life- our physical fitness rises up on the priority list. And in this we are often met with an overwhelming amount of information about what kind of exercise is best, which foods should be avoided, and just how to go about shedding those excess pounds. While it can be difficult to filter through the advice there are some things that can make this process a little easier to navigate. Perhaps the easiest solution of all is to create a home gym that can adapt to your needs as they change. 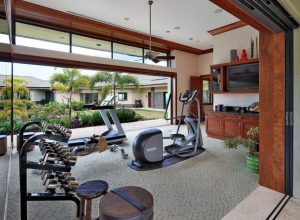 Big windows help this home gym feel open and expansive. A home gym is often quite different from commercial workout spaces. Rather than a huge room lined with mirrors, rows of cardio equipment and weight machines, and a huge assemblage of kettle balls and free weights, a home gym can be a sleeker, simpler space. In addition to the fact that you won’t need all that equipment for just a few people, you are also enabled to craft your space in a way that cultivates a calm determination. A small room will suffice for your home gym, but I recommend it be a room you enjoy spending time in. Choose a space with big windows and a view if you can, but free of distractions. Natural light is a big bonus and helps with both mood improvement and motivation. If natural light isn’t an option in your space, choose a lighting scheme that is gentle but provides ample illumination for your workouts. Depending on what kinds of physical activities you’re planning on doing, flooring can be an important component of your home gym. For many folks the home gym is a simple situation, and flooring materials can be of your choosing. Hard wood or wood alternatives create a warm, inviting feeling but can be in danger of damage if weights are dropped. Choose a hardy material that can stand up to the activity that will take place. Work with your architectural team to customize that bonus room or flex space into your home gym. Rather than just moving equipment into an empty space, you can cultivate a deliberate experience when working with a professional designer. 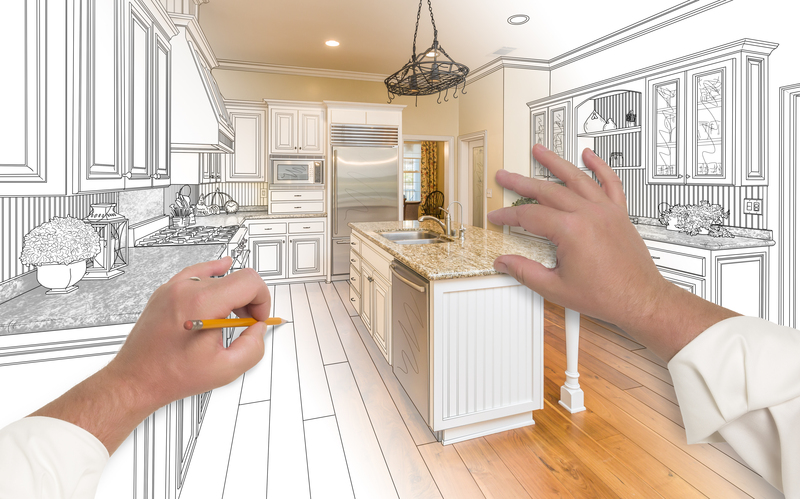 Built-ins, light sources, and structural adjustments can be added to your existing house plan, ensuring that your dream home comes together exactly as you envision it. 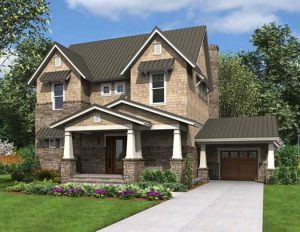 This entry was posted in Courtyard House Plans, Craftsman House Plans, Dream Home, Family Home, Floor Plans, Home Floor Plans, Home Floor Plans, Home Plans, House Improvement, House plans, Small House Plans and tagged custom design, dream home, home gym, house plans on July 8, 2016 by Admin. For all its many years in circulation, Craftsman house plans are still capturing the American imagination. The progeny of two distinct parents, the craftsman can be seen as the quintessentially adaptable American child. Paternal influence comes from Englishman William Morris’ rebellion against the Industrial Revolution. He perceived a profound discounting of the individual worker and a subsequent dehumanization of labor. In response, artisans gained prominence as a way to showcase the quality of individual craftsmanship. The mother of this style is the every-woman of the day, caught in the shifting tides of changing social structures and familial obligations. 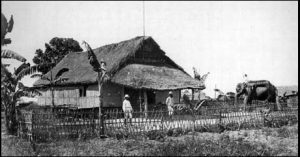 The woman of the house no longer typically had live-in servants and was mostly responsible for the housework along with the raising of the children. Out of this grew the need for a functional aesthetic, simple yet beautiful; a home for the modern family. Through this lens, we can trace the genealogy of the American family structure. And while the Arts and Crafts Movement increased in popularity, the Craftsman home gained prominence as the architectural embodiment of these shifting social elements. 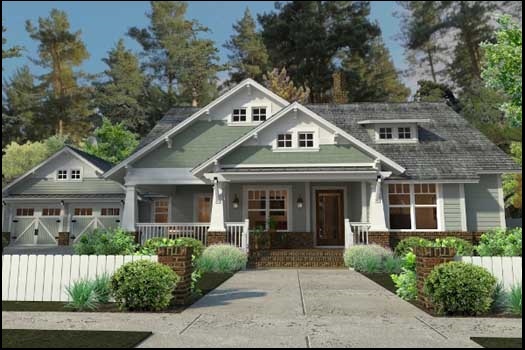 A gorgeous Craftsman house plan. 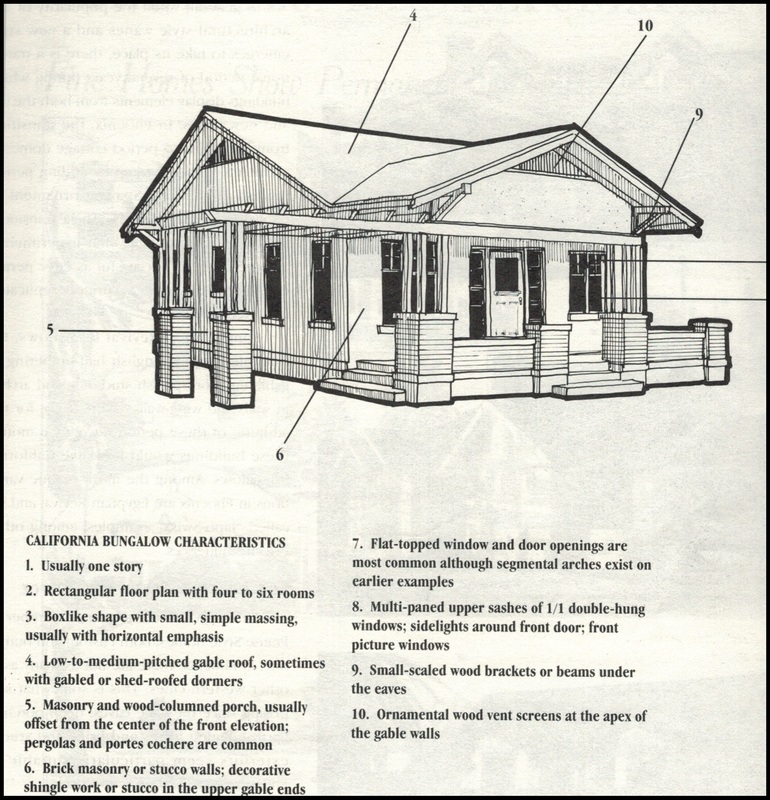 The typical craftsman home can easily be identified by a few consistent features. Externally, we see steep hipped roofs and visible gables which are often used to protect front porches under deep eaves. Exposed rafters or supporting brackets on the exterior showcase the workmanship that is so important to this style, while also adding an aesthetic flair. Double-hung windows are also common features, historically boasting a four-over-one or six-over-one design for decorative enhancement. But perhaps the most easily recognizable exterior element is the visible mixed materials both local and natural to the area. Stone, handcrafted wood works, and glass are major players in this style of home, paying homage to the handcrafted workmanship out of which this style originally gained footing in the American imagination. Interiors also reflected changes to the American family unit. Perhaps the most significant element to this design is the kitchen. As housekeeping needs changed, the modern family needed a way to interact in those spaces traditionally reserved for servants. In response, the kitchen was integrated into the main floor plan and provided open sight lines to other common areas of the home, including the back yard. As an amendment to the open kitchen, the breakfast nook was introduced as a place for the family to gather around meal times. Space that would historically have been used as a butler’s pantry were replaced with built-in cabinetry more functional for the modern family. This was also a space in which to showcase handcrafted wood and glass work so indicative of the Arts and Crafts style. Craftsman homes declined in popularity in the 1920’s or so, but came to the forefront again some 60 years later when many large cities in the United States experienced housing booms. In particular, California and Washington State saw large increases in population and growing local economies; the demand for homes for single family units was high. Even now, sales for Craftsman house plans are up from previous years. Partly because of the simplicity and functionality inherent to the design of a Craftsman house plan, we are seeing another push for these classic designs for modern families. 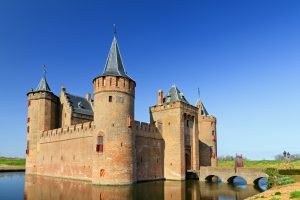 Perhaps it is a quieter cousin to the rebellion from which we first gained footing, but in this world of mass-produced everything and internet commerce, a return to the importance of hand-crafted features is growing in prominence. Moving away from some of the earlier interior elements like low ceilings, this archetypal design offers much room for adjustment. This is a plan inherently designed for adaptation. 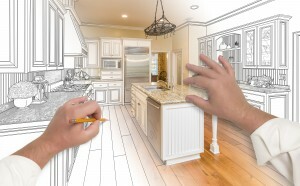 The foundational clean lines and connected spaces are a short step away from becoming the open floor plans so high in demand right now. With the addition of higher ceilings and larger windows, the cozy feeling of the traditional design easily transforms into the bright, open, adaptable space of the Contemporary Craftsman. An contemporary Craftsman house plan for the modern family. In either the classic or the contemporary incarnation, this design has been integral to the American concept of home for over 100 years. And, in true American fashion, its easily adaptable structure allows plenty of room for reinvention and creativity, and continues to showcase all that is best about individual workmanship. 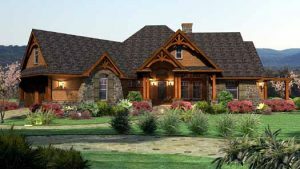 This entry was posted in 3D House Plans, Craftsman House Plans, Dream Home, Family Home, Floor Plans, Home Plans, House Improvement, House plans and tagged contemporary house plans, craftsman, dream home, house plan on July 1, 2016 by Admin. If your family include those of the four-legged variety then a well-planned out dog yard is a must-have for the long summer days. Many of our furry friends will opt to be outside when it’s hot and humid. And as every dog owner knows, a bored dog is a troublemaker. 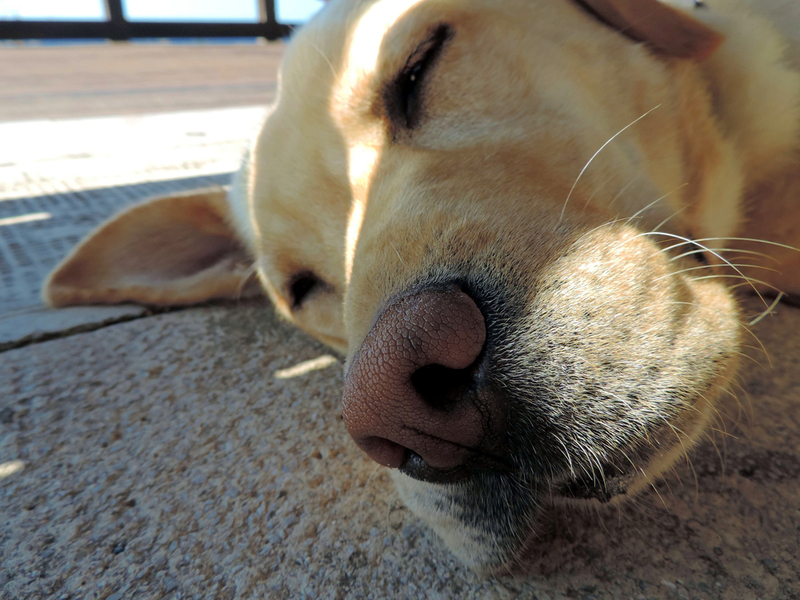 When planning out your dog yard, check out these features for a contented canine! 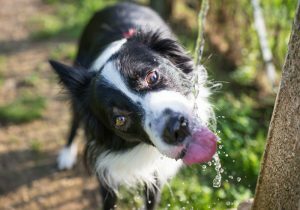 A water fountain in your dog yard keeps your dogs well hydrated in hot summer months. A physical necessity for dogs who spend the days or nights outside during the hot months, so why not make it a deliberate feature? Ranging from simple to complex, a drinking fountain for your pooch adds ambient sound to your dog yard while keeping your beloved pets hydrated. 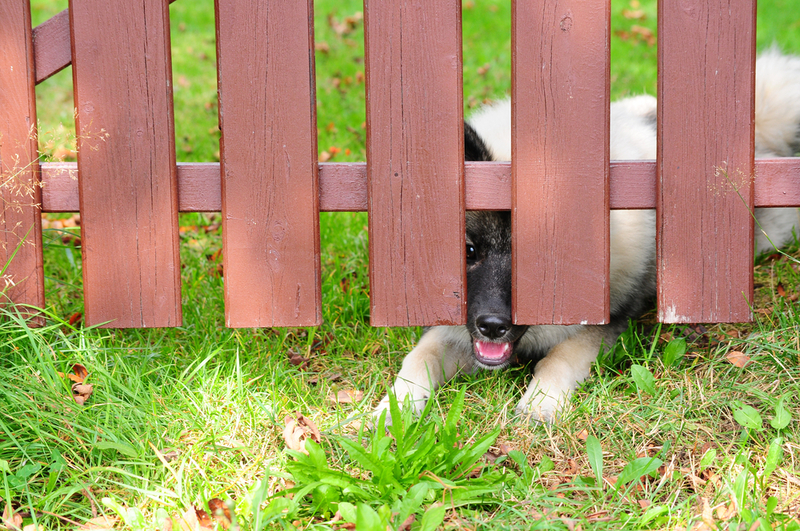 A good fence around your dog yard will keep everyone safe. All dogs love to run and are driven by their noses. 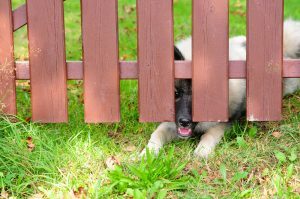 Proper fencing is a must to keep your dogs safe from environmental hazards such as vehicles, other dogs, and toxins in the area. It’s not enough to create a cool play space for them; good boundaries in a dog yard make them feel safe and allow their playful natures to come through. Everyone needs to be able to get away from the direct heat of the sun. Either with landscaping or with structures, provide plenty of cool spaces in your dog yard to rest and cool off in the high heat of the day. Provide shade in your dog yard for your pooch can rest from the heat of the sun. Make sure that your landscaping choices in the dog’s play area are safe to be around. Check out the ASPCA’s list of harmful and toxic plants here to make sure there aren’t any plants that could be dangerous to a curious pup. Also remember that pesticides and herbicides are toxic to animals. Consider using natural or organic pest control methods in areas where your dog will be spending a lot of his time. Build paths into your dog yard for your pup to scout and sniff around in. Dogs love to scout and sniff out their landscape. 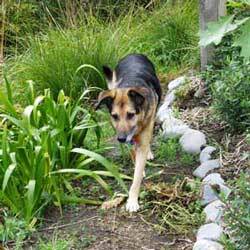 By creating paths through your dog yard you provide lots of prowling ground for them to investigate. Keeping their nose and mind active is one of the best ways to engage their curiosity– and it will tire out your dog for a well-behaved evening. Creating a play space for your dog needn’t take up valuable real estate in your back yard. Many of the features that will keep your pups happy and healthy have benefits for their humans as well. With a little creative planning, your backyard dog yard can be the ultimate hang out spot for the entire family. This entry was posted in Craftsman House Plans, Dream Home, Family Home, House Improvement, House plans, Outside Spaces and tagged backyard, dog yard, family, outside spaces on July 1, 2016 by Admin. 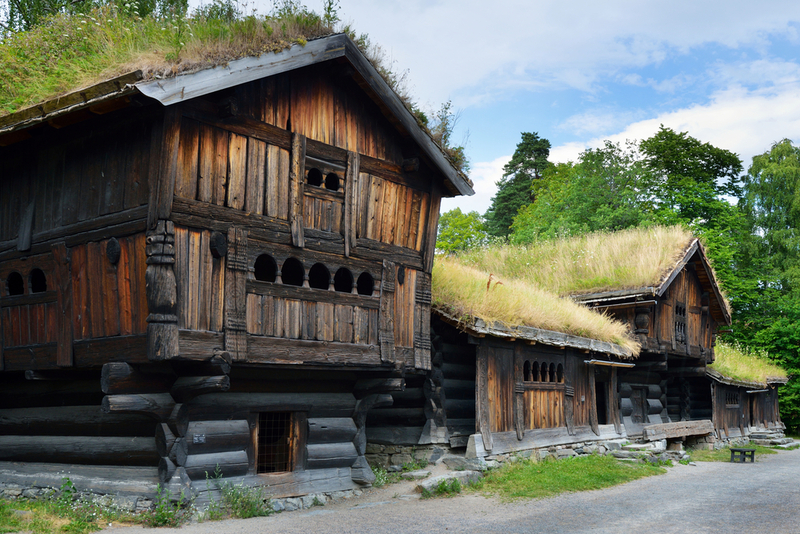 Human societies have been building and living in homes for thousands of years. 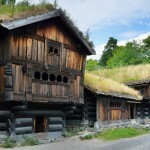 These historical architectural styles reflect regional influences as well as the ongoing development of human culture. 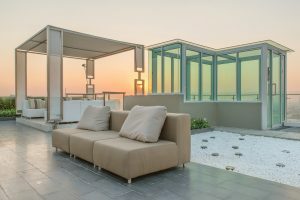 As societies form, the structures echo the needs of the present place and time and, over the years, this has come to provide us with numerous architectural styles that reference these past design trends and point towards our future. These days, we use architectural styles to denote those sociohistorical trends that guided past design choices. 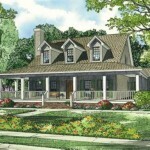 They are quite helpful when searching through a large archive of house plans on a site like MonsterHousePlans.com. 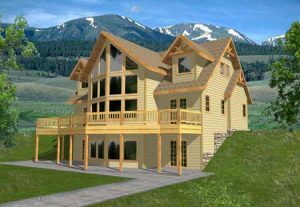 Ultimately, however, many of the distinguishing features of one house plan design style will also be reflected in other styles of house plans. 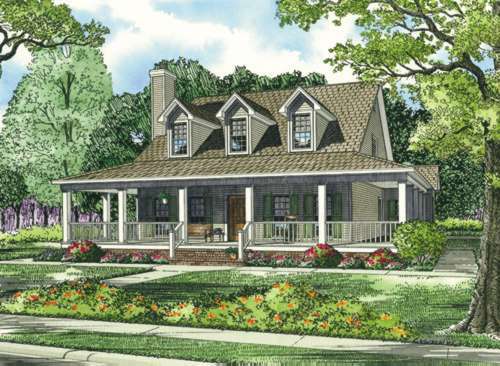 The wide front porch of the Southern Country style house plan is similarly a common feature of the ever-popular Craftsman house plan as well. It’s difficult to say which claimed the front porch feature first, or if they developed simultaneously. But this is just one example of the way seemingly-signature features are often incorporated into other design styles. This is good news for those shopping for their dream house plan. A good designer will meld various styles into a seamless reflection of the current trends while also applying an expert’s hand in terms of structural integrity and feasibility. As our lifestyles grow more diverse, the homes we choose to build echo our evolution. With modern families taking so many various forms it’s quite amazing really to see the way our clients are taking full advantage of the opportunity to create something unique and functional for their lives. 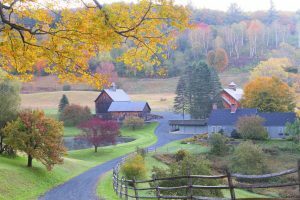 And although there are always some house plan styles that remain popular in the long term, there will also always be room for artistic development and socially-influenced modifications. Perhaps this is what draws us as architects to this field: this constant evolving of form and function, and the ultimate pay-off of a happy family loving the space they live in. This entry was posted in Craftsman House Plans, Dream Home, Family Home, Floor Plans, Home Floor Plans, Uncategorized and tagged architectural styles, custom home, dream home on June 7, 2016 by Admin.